The name Kenwood is well-known in many contexts. Thanks to the company’s focus on quality parts and excellent workmanship, it has become an expert in many of these spheres. Kenwood started this process in 1946 as Kasuga Radio Co. Ltd. Through many chapters of development, it established itself in Japan—its country of origin—as well as other countries such as America. It's one of the most widely known car audio speaker brands, but that's not all they do. It’s important to note that this company is not related to the homeware manufacturers that bare the same name. Here are some of the products that Kenwood—the sound company—is famous for. 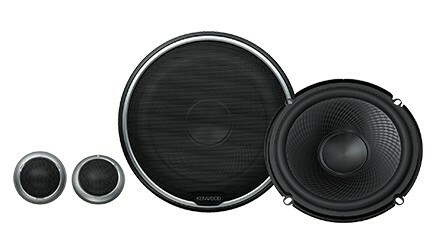 Kenwood’s Performance series contains many component speaker units. The speakers offer exceptional power handling. Thanks to their sleek modern look, they are an aesthetic as well as practical option to improve your vehicle’s sound setup. The speakers in the Kenwood Sports series offer vehicle owners a different type of look, thanks to the silver detail on each speaker. Some of them follow the customary round design, while others are oval in shape. Most of the sets feature speakers and woofers, while the KFC-6965S also has a tweeter incorporated. Each car model is unique and so is a vehicle owner’s preferences. Fit range is your answer. This series offers some unique speaker sets, as well as component tweeters, such as the KFC-ST01 set. You can add these to an existing system to achieve the exact results you need. The physical design of the cones gives excellent sound, but they’re not the most powerful speakers on the market. Choose a type which gives you the solution you’re hoping for, so your upgrade can be a long-term solution. Kenwood’s signature characteristics of quality and user friendliness are showcased in the KFC-1665S, a 6.5inch full range woofer driver with a two-way setup of the tweeter. This model in Kenwood’s range lies in a steel basket which protects all parts and helps to minimize vibrations. This basket is designed to keep noise cancellation to a minimum, which ensures clear, quality sounds. If you’re planning on installing these speakers yourself, you’ll love how easy it is. The speakers are expertly designed in so many ways. Firstly, most cars don’t require any holes to be drilled; you should be able to simply insert these units into the existing slots made by the manufacturer. Even the screw holes are set in the right place, so you can quickly secure the speakers. Grilles are included in your purchase, so you can keep your new speakers well protected. The frequency response of these speakers is quite extensive, so you can enjoy low, mid and high tones. However, keep in mind that these are not top-of-the-range speakers. If you push high and low tones at volumes too high, you will experience distortion. 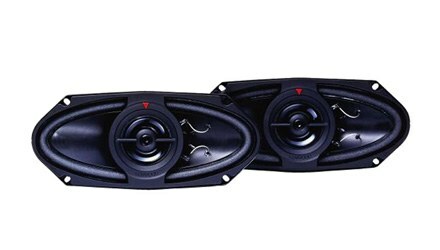 The 6x9 inch model from the Sports series, the KFC-6965S is designed to give car owners an affordable option to upgrade their factory speakers. Kenwood did an excellent job in designing speakers that perform well in various ways. Firstly, the sound you get from these speakers is clear, so you can enjoy your music as if you’re listening to it live. This is done via the propylene woofer and ceramic tweeter. This speaker can handle power of up to 400 watts—when installed in pairs—so you can opt to link them to an amplifier; they’ll be able to handle the pressure. Very low and high tones can be pushed through these speakers, but remember that they are more appropriate for mid ranges. If you need to feel your bass sounds, you may need to invest in an additional woofer. Unfortunately, the mounting depth is quite high at 3”, so you have to plan well before starting to install these. If you don’t have enough space in your door compartments, you’ll need help building a box or insert them elsewhere. Luckily, Kenwood helps you with this by suppling grilles and a box template. This is another of Kenwood’s speakers that showcase how they can make speakers pump out sound across almost all frequencies. The 4x10 inch model from the Custom Fit series offers great value for money. Both low and high tones can be enjoyed when listening through these speakers. Unfortunately, many customers have complained about the speakers not fitting their vehicles. The housings of these speakers are larger than many vehicles’ existing speaker spaces. 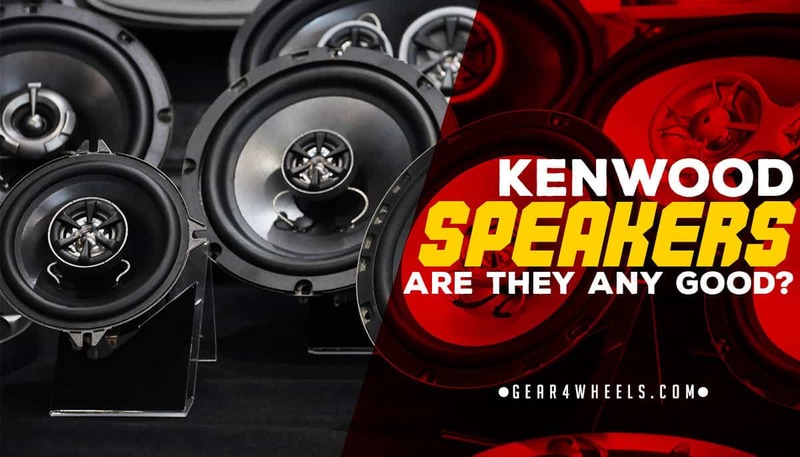 If you don’t want to customize your vehicle, you should opt for different speakers. In addition to this challenge, the unique oval shape means it won’t fit in customary round spaces. Is this a problem in your scenario? These speakers are an excellent option to upgrade your existing speaker system. These speakers are sold in sets, and when everything is connected, the system can handle quite high amounts of power. If you don’t trust the quality of this brand yet, remember it offers a standard 1-year warranty, which you can use when you experience problems. 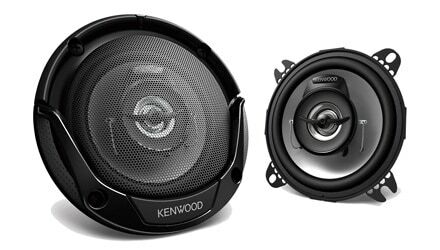 Kenwood is world renowned and made an impact on the car audio scene for a reason. Their products fall in an affordable price range which enables almost any car owner to enjoy the luxury of an enhanced sound system. You can’t go wrong trusting Kenwood, though you must always keep the particular product’s limitations in mind. This will help you enjoy the benefits for an extensive period of time.